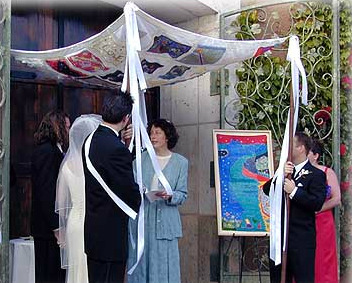 I officiate at weddings in the Greater San Francisco Bay Area of Northern California, and in surrounding areas. Bridget was a truly perfect officiant for our wedding. My husband and I are both Jewish, but more by tradition than by practice, as time has gone on. Still, it was important for us to be married by a rabbi. We could not have found a better match than Bridget. Her process of getting to know us was personalized and genuine. She took the time and the energy to learn who we were as people, and to craft a service for our wedding that was personal, authentic, and meaningful. The result was wonderful. We have had so many friends and family members tell us that they found our wedding service to have been so moving, relevant, and inspirational. And my husband and I certainly found it so!